Room hire services are provided by Glasgow Training Rooms - see link to dedicated site for more photos and information. Different room sizes are available for fixed costs - which means that prices per person work out lowest for filled larger rooms. 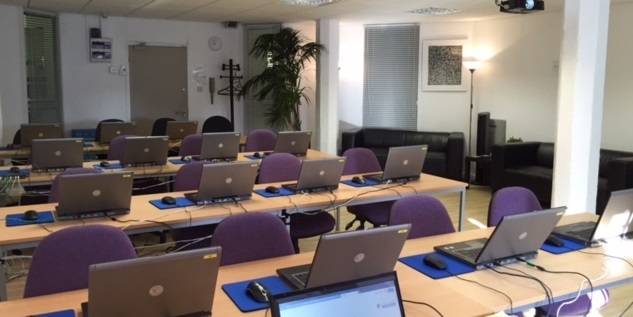 Options for IT Training Suites can be from under £25 + VAT per trainee per day. Costs for General Training Rooms (when filling one of largest rooms to its 24 trainee capacity) ...can work out to be from under £11 + VAT per trainee per day. Free instructor places are included with each room option, as is free and unlimited all-day tea, coffee and cooled water. Facilities consist of eight training rooms, breakout area and on-site cafe - with rooms for group sizes between 8 and 24 attendees plus facilitator/s - all seated with desk or table space. Data projector or large screen, trainer laptop loan plus strong and fast enterprise-class internet access via powerful Wi-Fi are all provided as standard. For a quick summary - see PDF on right. In addition, IT Suites have full on-site support, dedicated synchronous 100MB Hyperoptic fast internet (wired ethernet if required) and Microsoft Office with a choice of popular browsers as standard. For full details go to www.glasgowtrainingrooms.co.uk - or click image below.